The Ulsterman birdied two of his last four holes, finishing with a birdie at the 18th to card a fine 71 that left him on two over par for the tournament and tied for 32nd on two over par. After the disappointment of Thursday’s 75 and the improvement of a 72 on Friday, he was pleased to notch his first round in the red at Augusta since 2009 and only his fourth in 13 attempts. Now he plans to go out with all guns blazing today and he revealed afterwards that he will be making an appointment for a practice round with two-time Masters champion Jose Maria Olazabal next year. McDowell confessed on Friday that he simply doesn’t have the high draw off the tee that makes Augusta the perfect course for Rory McIlroy. He knows he must improve his chipping and bunker play to compete here, which is why he will be picking Olazabal’s brain at the earliest opportunity in 2013. McDowell said: “I’d love to win a green jacket; are you kidding me? So I’ve got to come back here every year and I’ve got to learn the golf course and I’ve got to accept it for what it is. “And he said to me, ‘How many times have you played here?’ I said, my fifth time. McDowell missed a great chance from about nine feet at the first but was soon motoring when he got up and down for birdie at the second and then rolled home a 25 footer at the third to get to two under for the day. He bogeyed the fifth off a poor drive and dropped another shot at the seventh when his approach hit the lip of the bunker and fell back into the sand. A sloppy bogey at the 13th sent him back to one over for the day. But he hit back to birdied the 15th and 18th and walk away feeling good about Augusta again. “I played nicely today, and you’ve sort of got to nearly play to all these pins a few times and just get the hang of it, foresee what to expect when the pins go in different parts of the green and learn these putts here at Augusta. Thursday’s extra-soft conditions hurt McDowell and exposed his lack of length. But as the week has worn on the greens and fairways have dried out, he has slowly moved up the leaderboard. “I need this place to be firm and fast,” he said. “I need that little bit of fire in the fairways just to make my second shots into the greens a little shorter, and I think when the greens are firmer and less receptive, you’ve got to be smarter and you’ve got to really be more precise with your iron play. 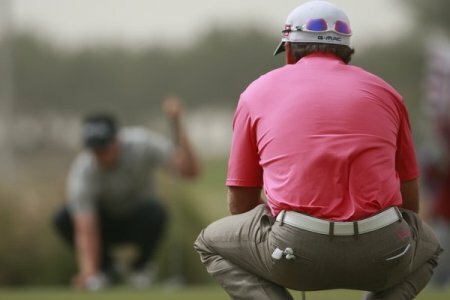 Graeme McDowell knows that he has work to do on his game if he is to become a Masters champion some day. Picture www.golffile.ieGraeme McDowell showed his mental strength at Augusta on Friday when he faced up to the harsh truths about his shortcomings as a playe and vowed to do soemthing about them.